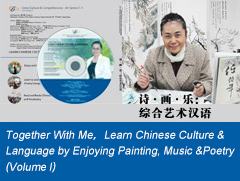 About Together With Me, Learn Chinese Culture and Language by Enjoying and Practicing Painting, Music and Poetry (Volume 2) and Its Participants. Message Board--Any questions, comments & suggusetions are welcomed. Feedback--You are welcomed to write to Shirley. Register--You are welcomed to register here & get Shirley's Friendly Greeting weekly free. Real Player -- Download it to listen to Shirley's Music and follow Shirley to read Chinese. Chinese Software -- Download a Chinese software to see Chinese Characters.